Need more information about booking Home 201178 ? Bookings are taken nearly all year round. Weekends - Friday to Monday for 3 nights and midweek bookings Monday to Friday - for 4 nights & full weeks commencing on either a Monday or a Friday. *** NEW *** FOR END MAY 2019 - WE NOW OWN 2 LODGES MISTLETOE ONE & MISTLETOE TWO AND THEY ARE NEXT DOOR TO EACH OTHER. THE DETAILS ON THIS LISTING & BELOW are for our MISTLETOE ONE BOUTIQUE LUXURY LODGE WITH HOT TUB - SLEEPS UP TO 6 PERSONS IN 3 BEDROOMS. MISTLETOE TWO BOUTIQUE LUXURY LODGE ALSO WITH HOT TUB - SLEEPS UP TO 4 PERSONS IN 2 BEDROOMS. PLEASE ASK FOR DETAILS IF YOU WOULD LIKE TO BOOK BOTH LODGES NEXT DOOR TO EACH OTHER SIMULTANEOUSLY SLEEPING UP TO 10 PERSONS COMBINED. WE OFFER A DISCOUNT FOR BOOKING BOTH LODGES TOGETHER - CONTACT US FOR DETAILS. For all reservations the booking process is only complete on the return of our own Booking Form. This form to be sent out to you, and we will automatically forward our Terms and Conditions and hot tub information. **We will accept 1 well behaved dog - must be added to your booking form which we will forward to you**. No other pets or reptiles etc are allowed. Our lodge can be booked either through Trip Advisor/Holiday Lettings or directly. Sometimes we can offer a small reduction on this site's prices when you make a direct booking with us. Mistletoe One Boutique Luxury Lodge & Hot Tub is a privately owned. It is 3 bedroom luxury Log Cabin Lodge. The lodge is fabulous and has an upmarket designer-look of a 'nature & wildlife theme' which runs throughout the lodge and is a lovely nod to the lodge's natural surroundings. Featuring luxury fittings, fabrics and quirky artifacts. All of this has been newly created to enhance your stay at Mistletoe One. If you want a feeling of being on your own then Mistletoe One is just for you. Our lodge nestles into an enviable spot on White Cross Bay and we are tucked secluded away at the head of a cul-de-sac, but only minutes walk from White Cross Bay's attractions. With it's own private carparking area for up to 4 cars, you can drive right up to the lodge for ease and convenience. The lodge has a sunny side elivated terrace with feature bi-folding doors giving a panoramic view of the park and opening on to the sunny-side deck from the lounge to where our 6 person HOT TUB is situated. It is Ideal of alfresco dining, sun lounging & sunset watching. We will accept a well behaved dog - MUST BE WELL BEHAVED at NO ADDITIONAL COST - we must be advised at the time of booking. The Hot Tub is fully serviced and has some natural privacy from the surrounding trees when in leaf. As soon as you open the door to Mistletoe One Boutique Luxury Lodge with Hot Tub you will fall in love with it! Our beautiful Lodge has a large spacious open plan living room, dining area and kitchen and features a 'Nature & Wildlife' theme. Wonderfully light spacious and airy it has been designed for your comfort and interest. The fully bespoke fitted kitchen features all the want for in integrated appliances and even has a wine cooler which is ready to pop your bottle of Prosecco into!! The external doors and windows have modern clean easy to use integral fitted blinds. The lounge has feature bi-folding opening feature window doors allowing the sun and view of the resort to stream into the room. It has an up to date leather corner sofa and a feature log burner style electric fire place. It has coffee tables, and a wall mounted 32" LCD TV & DVD player and a separate blue tooth speaker/CD system. Within Mistletoe One Boutique Luxury Lodge we have recently installed a password protected signal booster so you can achieve a stronger free connection to White Cross Bay's on site free of charge wi-if - please read our terms and conditions. There are also a playing cards and some other adult and children's boxed games & puzzles The open plan living space is heated with a large centrally heated radiator. This makes Mistletoe Lodge comfortable no matter what time of the year it is. The dining area is equipped for 6 persons. The luxury fitted kitchen with centre island includes a newly installed wine cooler & fully intregrated appliances - dishwasher, larder fridge separate freezer, full sized electric oven, microwave, and gas hob. The lodge has an electric kettle, toaster, George Foreman grill & it also has a Slow Cooker complete with recipe book - ideal for you to put in a delicious stew to slowly cook and be ready for you to eat after your day exploring the beautiful Lake District National Park area. All the bedrooms are NEW & beautifully appointed and have and all have the added luxury of beautiful co-ordinating curtains, giving a real special homely warm feel to the lodge. All Mistletoe's beds have the added benefit of being fitted with soft cosy mattress enhancers. The new Master KING bedroom (probably one of the few lodges on the resort to have a large KING BED) has a fabulous view over the park from its window and it has the benefit of an external doorway which opens on to the side sun deck and direct access to the hot tub. You can step right out of the bedroom and climb into the Hot Tub! This bed is fitted with modern bedside fitted furniture with incorporated independent reading lights & feature lighting. The room has fitted sliding wardrobes and a vanity/makeup area complete with 2 x double sockets with USB points & a stool - so great for sitting and doing your hair & face and charging your phone at the same time! It has a flat screen combination TV/DVD. This room is heated with an electric radiator. Mistletoe One Boutique Luxury Lodge’s 2nd Bedroom is stunning with feature tree wall graphics. It has twin bedroom fitted beds with feature bed side storage. Again, this room has a combination TV/DVD and it has a wardrobe and further open storage. This bedroom also has fitted bed reading lights and USB double sockets for your mobile devices. It is heated with an electric radiator. Mistletoe One Boutique Luxury Lodge’s 3rd Bedroom is a smaller room and will suit 1 or 2 adults or 1 or 2 children. This 3rd Bedroom has been fitted with 2 x 2’6” divan luxury pocket sprung beds which can be put together to make a 5’ king bed, (although only single bedding/duvet will be provided). The room has a moveable light weight drawer set which can be easily moved to allow the twins beds to be brought together to make a king-sized bed. This 3rd Bedroom also features a TV DVD combination unit, Games, Books, Puzzles etc. It has a small fitted wardrobe and has additional over bed storage boxes with feature lighting. This room is heated with an electric heated radiator. Mistletoe One Boutique Luxury Lodge with Hot Tub provides All bedding, (see 3rd Bedroom note of only single bedding provided for this room), Bath & Hand Towels along with Tea towels are provided - just bring your personal towels for the Hot Tub use. The duvets are all high quality Hungarian goose down & all pillows are anti allergy - all to ensure guests have excellent sleep quality. There is an Ikea highchair available for you to use if needed and the lodge has a Mothercare Travel cot. Cot bedding is not provided. A fabulous bathroom which includes a separate step-in shower enclosure. It also features a magnificent vintage style roll topped bath and marble topped wash basin vanity area, the bathroom is pure luxury. It also has 2 heated towel rail/radiators - one for summer use and one for winter use and in winter the radiator is continually on for your comfort. OUTSIDE MISTLETOE ONE BOUTIQUE LUXURY LODGE - We are so lucky to have so much area around our lodge giving it a feeling of 'I'm on my own out here', but being a stones throw from all the amenities of White Cross Bay's 5* resort. It is exceptionally private & secluded particularly in the summer time when the leaves are out on the trees. There is a generous carparking area for up to 4 cars. As you go up the 9 steps from our carpark to the lodge, glance to the right and you will see our Fairy Steps & our special little Mistletoe Lodge Bird Feeding Lodge! At the front of Mistletoe Boutique Lodge there is a useful under cover area, where you can still enjoy the outside no matter what the weather and if you sit quietly, there's There is a small children's table and 2 chairs an Ikea high chair, and a relaxing single cushioned chair for kick-back times and to quietly watch the abundance of wild life . Mistletoe One Boutique Luxury Lodge has it's very own friendly robin who will come and join you and take food from your hands! You can also see, hundreds of other birds, rabbits, squirrels and if you are very lucky you can sometimes get a visit from the wild deer who love to visit our lodge's woodlands and bracken area. There are two decked patio areas one at the front and one at the side - so you can follow the sun! The front decked patio features an external dining table and 6 chairs. 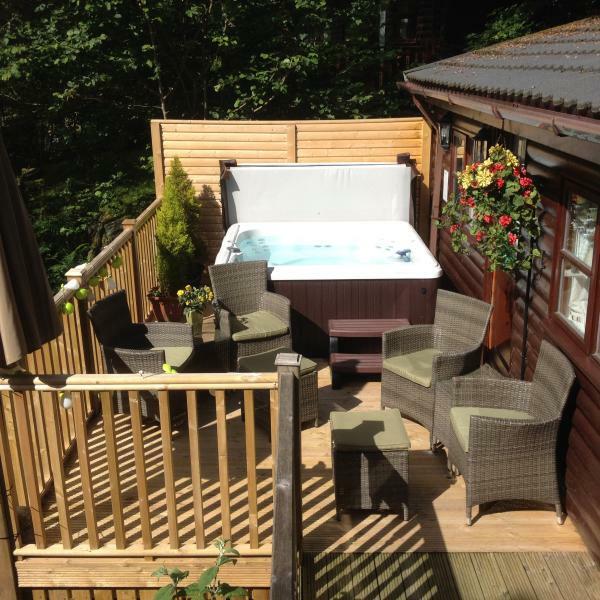 The south-west facing is where the Hot Tub is sited and has comfy seats & is in just the right spot for an evening in the hot tub watching the sun sets. Mistletoe One Boutique Luxury Lodge's Hot Tub is regularly professionally serviced. When you receive your quote it will include the following: Our complete 3 bedroomed lodge sleeps 6 and we provide all freshly laundered bedding, bath & hand towels, washing up drying towel, all electricity and gas and UNLIMITED USE OF OUR PRIVATE HOT TUB. Your quote will show an additional £10 Private Hire Fee. White Cross Bay charge guest for using privately owned lodges - £10 for each hire. If you want access to White Cross Bay's leisure facilities (indoor swimming pool, sauna, gym etc) then the charge is £15 for all guests for the duration of your stay paid locally at White Cross Bay's Reception. Our own terms and conditions will apply to your booking and we request our booking form is completed for all guests staying at our lodge - this is compulsory. We can post these out to you or email them across. A booking will not be fully accepted until we have your completed form returned to us. EXTRA INFO It is important to note that White Cross Bay is a family orientated luxury resort & they do not accept any Stag or Hen parties staying in any of their lodges or privately owned lodges (like ours) on their park. We ensure that our holiday Lodge is maintained to very high standards and is professionally cleaned with HEPA filters to ensure all our guests, including those who may have dog allergies have a comfortable stay. We include free of charge of an Ikea High Chair and a Mothercare Travel Cot (no bedding for this cot is provided). White Cross Bay is approx 1.5 miles from Windermere, 2.5 miles from Bowness & 2.5 mikes from Ambleside. There is such diversity and an unrivalled choice of things to see when you stay in the English Lake District and whether you are considering the lake district as a holiday destination for the first time, or like us you just keep coming back to holiday at a place you love, there's always something to see & do. A short walk from the Park entrance towards Ambleside is Brockholes - The Lake District Visitor Centre where there is something for everyone to do from 'Tree Top Trek' for the teenagers, Bike Hire, Lake Cruises, Pony Rides, Exhibitions, Mini Golf etc. All this is within a 15 min walk from the Park. Also within the White Cross Bay Park Centre there are an abundance of leaflets giving you lots of ideas for things to do. From the front of White Cross Bay you can catch several buses to other parts of the Lake District - Bus 555 can take you one way through Ambleside to Gasmere and onwards to Keswick. The other way it will take you to Windermere and then Kendal. Other buses service Hawkshead & Coniston from the front door step of White Cross Bay Resort! Taxis can be booked from the resort entrance. Any further info you require - just ask us. I am always on hand to be of assistance with all matters concerning with your holiday and your holiday planning. So, just get in touch and let me be of help. Please note - part weeks - we only accept bookings for 4 nights Mon to Fri or for 3 nights Fri to Mon. Available only to book for guests +25. Please contact before booking for exceptions to this. Also, we are unable to accept bookings for stag and hen parties - White Cross Bay is a family orientated luxury resort. For all single gender bookings please contact us before requesting to book. We will only fully accept your booking on receipt of our Booking Form - details will be sent to you. Response from the owner Many thanks for taking the time to review your stay and we are delighted to know that you had a wonderful time. We are about to completely refurbishing the 3 bedrooms and we are giving the rooms all new looks - lots of surprises for anyone returning. The lodge will then sleep 6. We do hope that you will return and be enchanted by a little bit more Mistletoe Lodge Magic! With regards & thanks Pam Ellis & Family. You'll need to send Pam (the owner) an enquiry to book - the owner will let you know how to pay. If they accept online booking they'll send you a quote and info on how to pay. If you pay through our website you’ll be covered by Payment Protection. Or you can send Pam (the owner) an enquiry through the contact form to request a quote. Pam (the owner) will email you the total cost for your dates and how to pay. Send Pam (the owner) an enquiry through the contact form requesting a quote for your holiday dates. Pam (the owner) will email you the total cost for your dates and how to pay. Pam (the owner) of this property is responsible for taking and refunding your damage deposit. The damage deposit terms should be agreed before booking and outlined in the booking contract, if Pam (the owner) supplies one. Please refer to these details or contact Pam (the owner) directly if you have any questions. You'll need to contact Pam (the owner) to cancel. They should have provided their contact details when you made your booking - otherwise, email them through the contact form. You'll need to contact Pam (the owner) to edit your booking. They should have provided their contact details when you made your booking - otherwise, email them through the contact form. Estimated price per night based on a weekly stay. Owner fees of $13.00 per stay may apply. Enter your dates to see the total cost.